Although I never thought of myself as someone who would enjoy using a slow cooker, since I bought mine a year ago I have completely fallen in love with it. When I know I will have a busy day coming up, I try and plan a slow cooker meal that I can assemble in the morning, turn on, and have ready by dinner. 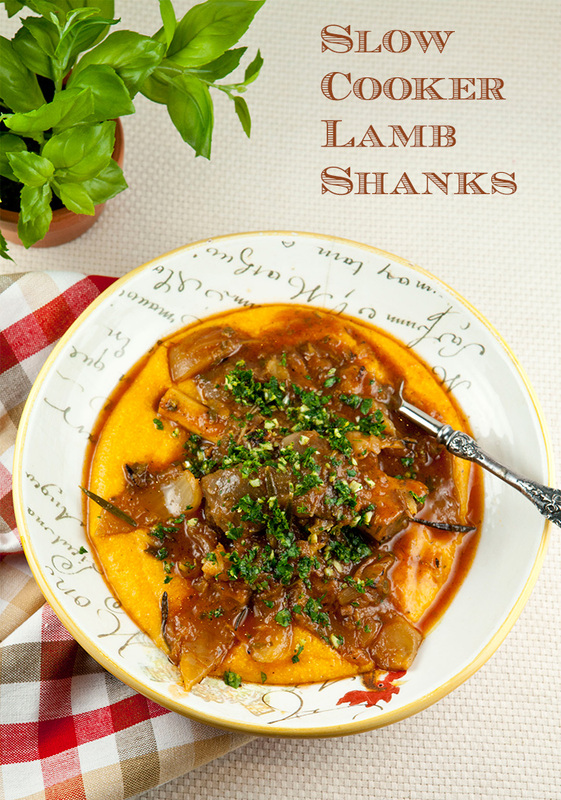 Shanks of any variety, whether they are lamb, veal, or pork are great cooked in a slow cooker as this type of meat lends itself perfectly to slow braising. After 6 hours in the slow cooker, the meat literally falls right off the bone. Although you could add carrots, mushrooms or celery to this dish, I decided to keep it simple, and chose to use just fennel and onions instead. 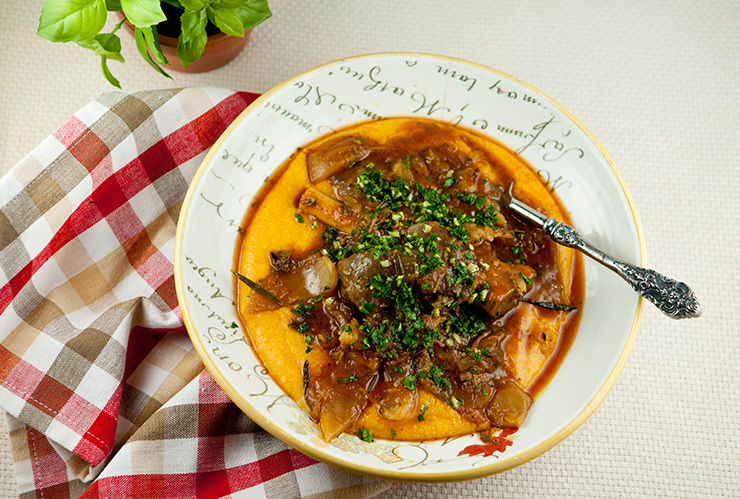 To serve my dish, I made a pot of quick cooking polenta flavored with sweet potatoes and which complimented the rich flavors of the shanks perfectly. 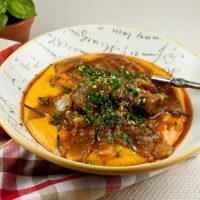 When serving rich, braised meats, a topping that is made from combining parsley, lemon zest, and garlic called gremolata really brings the flavors of this dish together. Put the onion, fennel, garlic, broth, tomatoes, tomato paste, thyme and bay leaf in a slow cooker and stir to mix well. Season the lamb shanks with salt and pepper. In a large sauté pan over medium-high heat, warm the olive oil until hot, then add the shanks and brown well on all sides, about 8 minutes total. Transfer to the slow cooker. Remove the sauté pan from the heat, pour in the wine and return to medium-high heat. Bring to a simmer, stirring to scrape up any browned bits from the pan bottom, then add the wine to the slow cooker, cover and cook on low for 6 to 7 hours according to the manufacturers instructions. To make the gremolata topping, place the parsley, lemon zest, and garlic on a cutting board, and use a sharp knife to finely mince. Remove the bay leaf from the cooking liquid. 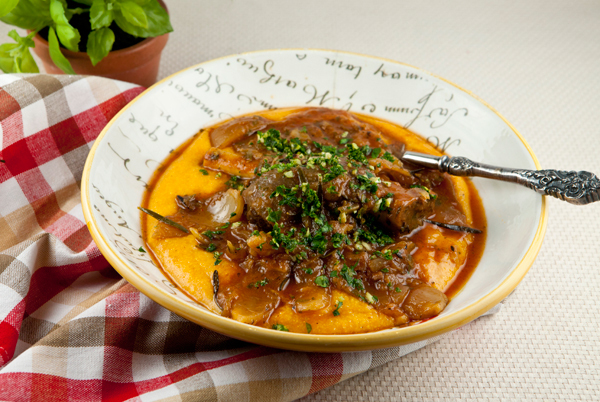 In a pot, mix the polenta with the broth, mashed sweet potatoes, sage, salt and pepper and cook until tender following manufacture's directions. Once cooked, stir the butter into the polenta. 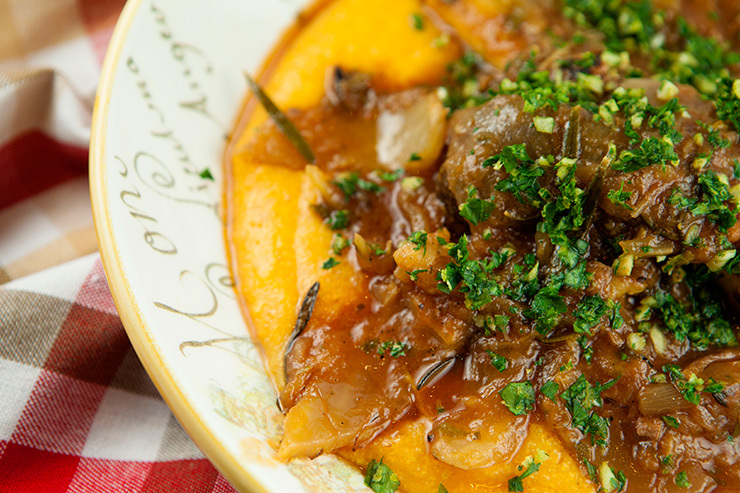 Spoon the polenta onto four individual plates, then top with lamb shanks, sauce and vegetables, and serve immediately topped with a spoonful of gremolata.